The Beatles are the most popular and best-loved band the world over - it's been that way for almost five decades and there's little reason to believe things will change any time soon. From senior citizens to aging baby boomers to tweens and pre-schoolers - the Fab Four's appeal is magical and certainly no mystery. Which makes Beatles-related gifts the perfect choice for just about any music lover. 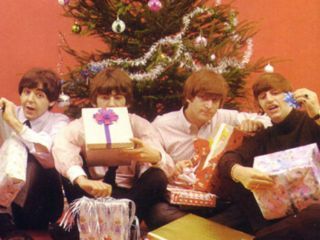 MusicRadar has compiled an expert list of presents sure to please please the Beatles fan in your life. Some are budget-priced while others are across the universe. So roll up and take a trip on the long and winding road of fab Xmas gift ideas. Legendary photographer Jim Marshall was the only lensman allowed backstage at this historic gig at San Francisco's Candlestick Park on 29 August 1966. The Beatles arrived in an armored car and when they got out, Marshall was there to click off some shots. Check out John Lennon doing some shutterbugging of his own. This stunning photo is silver-gelatin, hand-printed and features 100 percent archival rag mat board. The 11 x 14 is $1,600.00 while a 16 x 20 version goes for $2,130.00. The Beatles have been so extensively documented, you might wonder, Is there anything new that can possibly be uncovered? In this case, yes. Noted author Phil Norman, who wrote the best-selling Shout! conducted exhaustive research and has written about Lennon in painstaking detail. By the end of this masterful bio, you might know more about Lennon's life than your own. This four-CD set captures the manner in which Americans met and fell in love with The Beatles. Meet The Beatles, The Beatles' Second Album, Something New and Beatles '65 - they're all here, digitally prepared from Capitol's album masters in both the original and stereo mixes. Older fans will feel like they entered a time warp, while younger fans will hear the band's US releases the way they originally were presented. Required viewing for any Beatles fan, this five-DVD set was a 1995 TV series that chronicled the Fab Four's history and was made with the full cooperation of the surviving Beatles and family members.The wealth of material is copious and there's never a dull moment - concert footage, TV show appearances, film clips from the Cavern Club, the whole lot. Best of all are the interviews with the Beatles themselves (John is represented in archival clips). Along with priceless footage of mid-'90s-era Paul, George and Ringo jamming, there's a fascinating section in which the three gather round a mixing console with producer George Martin and try to figure out just how they recorded Tomorrow Never Knows. A must-have. There are more Beatles tribute bands than of any group around. But only the Fab Faux, led by Will Lee from Late Night With David Letterman and Jimmy Vivino from Late Night With Conan O'Brien, truly nail the catalog - and that includes the group's solo recordings - with note-for-note perfection. Forget wigs and costumes, this five-piece group, which also includes Rich Pagano, Frank Agnello and Jack Petruzzelli, will make you think you've seen and heard Beatles concerts that might-have-been. Although they mainly play the New York area, the Fab Faux have performed all over the world. Check out this extraordinary video of the Fabs being put through their paces by Beatles engineer Geoff Emerick. Whenever John Lennon played a guitar, it became a powerful instrument of change. You just might feel such magic when you pick up Gibson's loving recreation of Lennon's early-'70s favored guitar, the same model he played at Madison Square Garden at his famous One To One concert. Long a fan of jazz legend Charlie Christian, Lennon had a Charlie Christian pickup installed in the neck position of the guitar, and the result was a clear, biting sound. The makers at Gibson's Custom Shop went over every inch of this limited edition with a keen eye for detail. From the cherry finish to the various dings and dents, it's as close to the original as it gets. It's Monopoly, only Beatles-ized! The traditional game play allows Beatles fans to own and trade some of the greatest icons in Fab Four history. Traditional houses and hotels are renamed Listening Parties and Concerts. Six custom pewter tokens include The Walrus, Here Comes The Sun, Maxwell's Silver Hammer, Strawberry, Octopus's Garden and Rocky Raccoon. The perfect activity while listening to your favorite Beatles albums. No, The Beatles aren't on iTunes yet, but this is the next best thing: a numbered 120G video iPod in classic black, etched with the Beatles' logo on the front and Abbey Road on the back. Includes all 13 original Beatles' CDs, plus the two Past Masters collections and the Love set. Also included is an engraved guitar pick. Packaged in a box designed by Psycho Bunny. Only 2500 available. Available exclusively from Bloomingdale's. Like millions of Americans, New Jersey's Smithereens came to know The Beatles from the epochal album Meet The Beatles. To celebrate the 43rd anniversary of its release, the band rerecorded the disc in its entirety, and they do so with gusto and reverence. From the wham-bam charm of I Want To Hold Your Hand to the wistful doo-wop harmonies of This Boy to the propulsive thrill of I Saw Her Standing There, leader Pat DiNizio and the gang recapture the exuberance of 1964 like nobody's business. A single vintage Beatle autograph is a item to be treasured, but all four on the same page is a one-of-a-kind thing of beauty. This 4 1/2 x 4 aqua blue album page was signed in blue ballpoint by all four Beatles on 7 June 1963 (that's Paul's 'Beatles' next to his signature - surely, a year later he wouldn't have to identify the name of the band anymore). The signatures are well proportioned, clear and in near-mint condition. The autograph page is house and framed with an authentic 'Nempix' publicity photo of the boys taken by famed photographer Dezo Hoffman. If you've got the cash, grab it. Yes, there are other 'Butcher Block' LPs out there (Capitol's unreleased version of The Beatles Yesterday And Today album with the group dressed in butcher smocks and covered in meat and disembodied baby dolls). What makes this historic item truly unique is that it's a 'first state' version in its original shrink wrap, and is the last copy owned by Alan Livingston, one-time Capitol Records president who signed The Beatles to the American label. A spectacular collectible, accompanied by a signed, notarized letter of authenticity. As an added bonus, there's a copy of the recall letter that went out to distributors in 1966. Take out a loan and pick this up. It'll only grow in value. Genesis Publications is renowned for its signed and numbered limited edition books on pop culture. Golden Dreams is the follow-up to the sold-out Liverpool Days, and finds famed photographer Astrid Kirchherr training her lens on The Beatles during the filming of A Hard Day's Night. As most Beatles fans know, Kirchherr befriended the band when they first visited Germany in 1960, and she became engaged to the group's original bass player, Stuart Sutcliffe. Golden Dreams is limited to 2,500 individually numbered copies, each personally signed by Kirchherr and Max Scheler, who also contributed photos. Okay, so it's not a full drum kit, but it is a pretty wicked piece of memorabilia. Issued in 1964, the Selcol Beatles Ringo Starr 'New Beat' kit includes a snare drum, sticks, instructional booklet, tightening key and support legs. The drum is in mint condition, as in never used, and it comes in its original box. The Selcol company sticker is still attached and the all metal parts are described as shiny new. You can't really call yourself a Beatles fan if you don't have a Beatle wig, now, can you? Here's the genuine article, a vintage mop top - unopened to boot. Billed on the die-cut header card as 'the only Authentic Beatle Wig.' lest you fall for those crazy phoney mops, the wig itself is in excellent condition and still sealed in the original package. So put on your Beatles hair and get with the now sounds from those Liverpool boys from this Christmas.